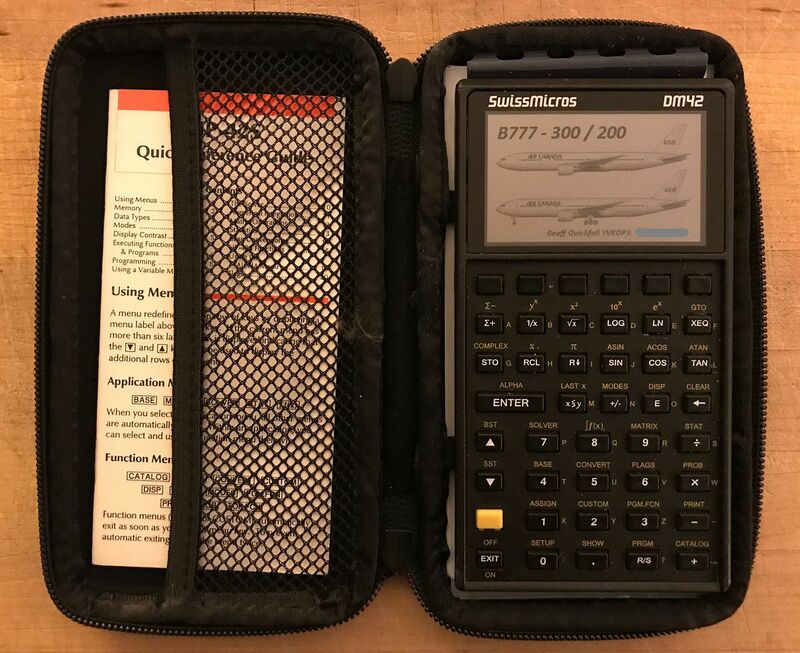 The Swiss Micros pouch is nice, very nice. It has been mentioned that it is very tight which can be a good thing. Since my incident with the drop and skid off the car roof I changed the pouch that the calculator sits in. So, I changed from the Swiss Micros pouch to the HP30b (WP34s). Then I added the QRG for the 42S, to the package and switched the pouch to an HP42s vintage soft leather one. This is what slid off the roof of the car, impacted the pavement at 40kph (for our young metric friends) after falling 80cm to said pavement. 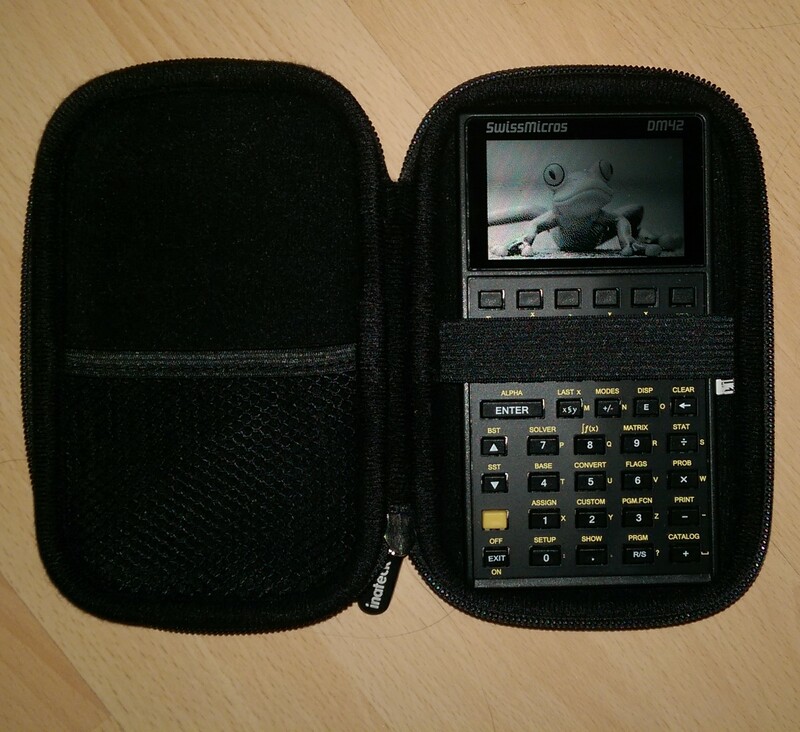 The pouch, although attractive, did not contain the calculator which slid out of the pouch, face down on the pavement, comming to a stop about 60cm from the pouch. I have now switched to what I think is the most useful pouch ever designed by HP. 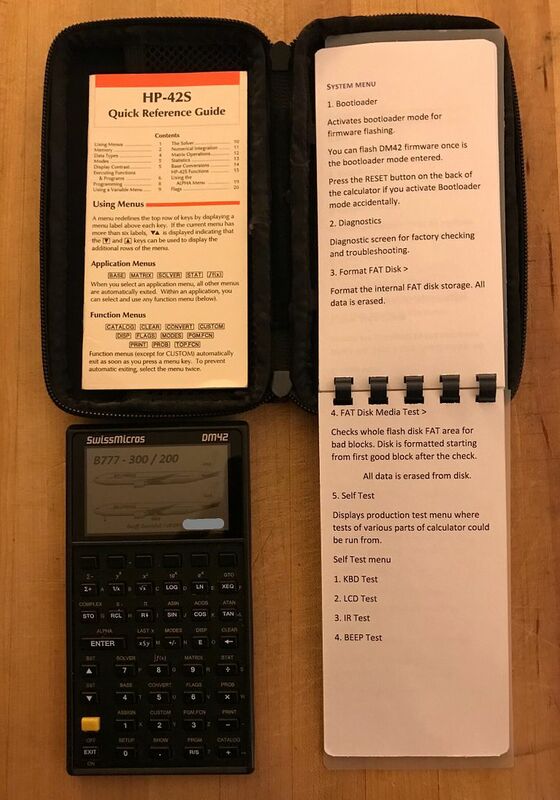 I created a user manual by converting the HTML Swiss Micros online user manual to text and formatted it to fit a 6.4cm by 12.7cm page. Double print both sides, and then bind it to create a booklet of the same size, with fourteen pages. This did not fit the HP35s pouch. But it does fit an HP 67 pouch. The DM42 fits the inner sleeve and my QRG and manual fit the spot usuall6 reserved for the 67. I have a few of these and they house my 41CL, Panamatik 29E IR GPS and some others. Both the 35s and the 67 pouches allow for the quick notes you create to remind you which calculator states exist and what is each state. If the calculator had been in the 35s or 67 pouch there would have been no scuff marks and, I just noticed, a very small 2mm shallow scratch on the gorilla glass. 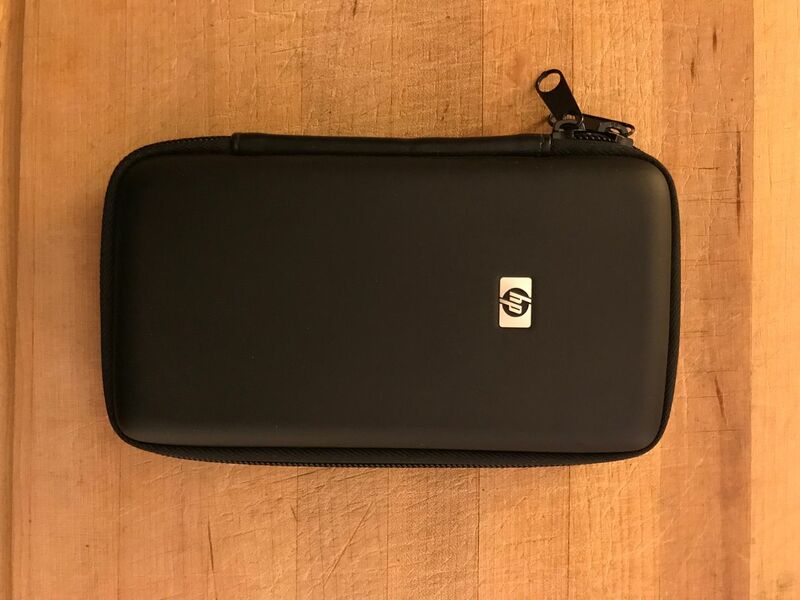 If you want to, you can get a blank circuit board, cut it to fit in the inner sleeve of the 67 pouch creating a protection from impact of the DM42 and leave the DM42, QRG and personal notes in the main section. Most of us did this for the 48 soft pouches. I use the 35S semi-hard case as well. It lets me fit the QRG and a small reference book. 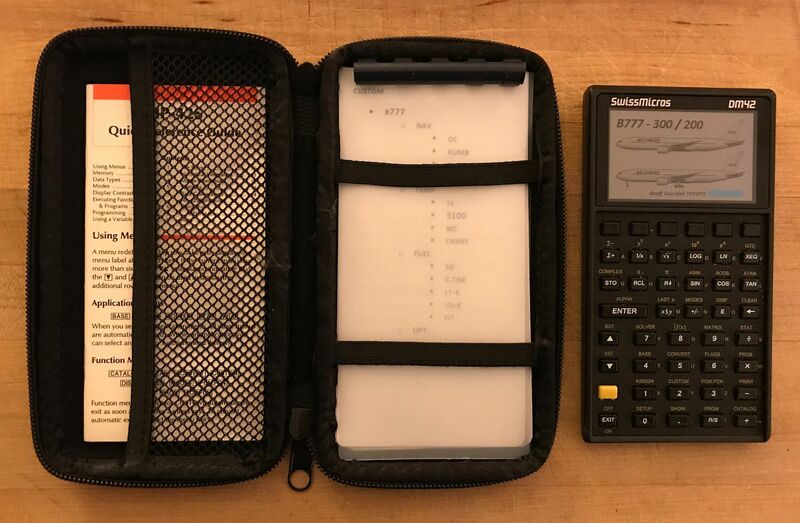 The elastic straps don't fit in the right place to allow the calculator to be used in the case, but that's not a problem for me. raise the calculator up a little bit. Speaking of cases, a zip-up carrying case for external, 2.5 inch hard disk drives seems to be about the right size. This is what slid off the roof of the car, impacted the pavement at 40kph (for our young metric friends) after falling 80cm to said pavement. Errr, what kind of car do you drive again? It's a very low-slung car! 183cm, I type to fast for the iPad and then get lazy by not checking. Of course it might have been a lotus Europa from 1967! The one I actually tested (because I already had one) was this one from Inateck. There are "Amazon Basics" versions that look similar. The DM42 is a slightly tight fit at the top and bottom, but there is enough "give" in the case to squeeze it in and zip it up, and there is room to store a USB cable too. I took the dm user manual and converted it to text. Added my custom programs to it. Modified and removed some of the text to suit my needs. Then created the QRG you see here. Also included the QRG for the HP 42s.